Try our satisfaction guarantee - compare our garnet gemstone prices and our quality. This page has many garnet gemstone photos, so it will load more slowly! It contains photos of garnet gemstones in several of the natural garnet varieties, including almandine garnet gems, demantoid garnet gems, mandarin garnet gems, rhodolite garnet gems, spessartite garnet gems, and tsavorite garnet gemstones. This beautiful Mozambique garnet gemstone has dark red natural color; it is unheated and untreated. This dark red garnet gemstone appears almost black under some lights, with deep red flashes in its depths. This superior grade Mozambique garnet gemstone is completely eye clean even under close inspection with bright illumination (GIA: Type I, VS), and it is well cut. See also a side view photo of this natural red garnet gemstone. This small size natural color demantoid garnet gem is well faceted in a round cut with good brilliance. It has beautiful medium yellow green natural color (this natural demantoid gem is unheated and untreated). This demantoid gemstone is completely eye clean (GIA: Type II, Clarity Grade: VVS). Under magnification with bright illumination it shows faint horsetail inclusions. This fine quality collector gem of natural andradite garnet has a natural color change with brownish-green natural color under daylight, while under incandescent light the color of this rare garnet gemstone is a strong yellow-gold color! Andradite garnet with natural yellow-gold hues is known as topazolite garnet. This natural color topazolite garnet gemstone is very well faceted in a round cut with excellent brilliance. It has very beautiful color under daylight (as shown at left) with flashes of brown and green in its depths that remind one of andalusite (this natural andradite garnet gem is unheated and untreated). This fine quality topazolite gem faces up clean, with faint natural inclusions that are only visible under very close examination with bright illumination (GIA: Type II, Clarity Grade: VS). The image at left was taken under daylight, see also a photo of this natural topazolite gemstone under incandescent light. This 0.86 carat natural color demantoid garnet gem is well faceted in the square cushion cut style with good brilliance. It has beautiful medium deep green natural color (this natural demantoid gem is unheated and untreated). This demantoid gemstone is nearly eye clean (GIA: Type II, Clarity Grade: VS ). Under magnification it shows a dramatic horse-tail inclusion beginning near the culet and spreading through out the gem. This 2.70 carats natural color demantoid garnet gem is well faceted in the oval cut style with good brilliance. It has beautiful deep green natural color (this natural demantoid gem is unheated and untreated). This demantoid gemstone is nearly eye clean (GIA: Type II, Clarity Grade: VS ). Under magnification it shows a small inclusion under a crown facet of the gem. Under very close inspection,this is the inclusion that may possibly be seen by a trained un-aided eye. This 1.28 carats natural color demantoid garnet gem is well faceted in the round faceted style with good brilliance. It has beautiful medium deep green natural color (this natural demantoid gem is unheated and untreated). This demantoid gemstone is nearly eye clean (GIA: Type II, Clarity Grade: VS ). Under magnification it shows the sought after horse-tail inclusion mostly toward one side of the gem. This fine color gem quality demantoid garnet gem is exceptionally well faceted in this round brilliant cut with superb brilliance. It has very beautiful medium green natural color (this natural demantoid gem is unheated and untreated). It faces up very clean, with a faint needle type inclusion that is only visible under microscopic examination (GIA: Type II, Clarity Grade: Eye-clean). This is a large, high quality "gem" demantoid garnet. This fine color gem quality demantoid garnet gem is exceptionally well faceted in this round brilliant cut with superb brilliance. It has very beautiful medium green natural color (this natural demantoid gem is unheated and untreated). It faces up very clean, with faint inclusions possibly visible under close examination with a trained eye (GIA: Type II, Clarity Grade: V S ). This is a nice, good quality "gem" demantoid garnet. This fine color gem quality demantoid garnet gem is exceptionally well faceted in this round brilliant cut with superb brilliance. It has very beautiful medium slightly blueish green natural color (this natural demantoid gem is unheated and untreated). It faces up very clean, with faint inclusion only visible under microscopic examination (GIA: Type II, Clarity Grade: Eye-clean). This is a nice, high quality "gem" demantoid garnet. This fine quality hessonite variety of grossular garnet gemstone was mined and then faceted in a cushion cut shape in Sri Lanka (Ceylon). It has a beautiful medium dark tone of slightly brownish-orange (burnt orange) color, with rich red-orange tones under incandescent light. This is an eye clean gem with faint natural inclusions that are only visible under magnification. It was very well cut with very good proportions and no window. When looking into the depths of this stone with magnification and overhead light you can observe a heat wave effect reminiscent of burning coals. This is a very nice gem hessonite and a great jewelry or collector�s stone. This Hessonite variety of Grossularite Garnet was mined and faceted in Sri Lanka. This gem is a beautiful medium dark tone of brownish-orange (burnt orange) color. Visible in this stone, using magnification, can be seen the "treacle", or heat wave effect, typical of most Hessonite garnets. This hessonite gem is very clean with minute inclusions visible only with magnification. This Hessonite variety of Grossularite Garnet was mined and faceted in Sri Lanka. This gem is a beautiful medium dark tone of brownish-orange (burnt orange) color. Visible in this stone, using magnification, can be seen the "treacle", or heat wave effect, typical of most Hessonite garnets. This hessonite gem is very clean with minute inclusions visible only with very careful examination and a trained eye. Hessonite Faceted Gems (2) , 6.15 carats T wt. These Hessonite variety of Grossularite Garnets were mined and expertly faceted in Sri Lanka. These gems are a beautiful medium dark tone of brownish-orange (burnt orange) color. Visible in these stones, using magnification, can be seen the "treacle", or heat wave effect, typical of most Hessonite garnets, plus a plethora of minute crystal inclusions. These gems are a very nice match for use as ER's or as side stones in a ring. They have look very similar to the Nigerian Spessartite garnet. This Hessonite variety of Grossularite Garnet was mined and expertly faceted in Sri Lanka. This gem is a beautiful medium tone of brownish-orange (burnt orange) color. Visible in this stone, using magnification, can be seen the "treacle", or heat wave effect, typical of most Hessonite garnets. This hessonite gem is nearly eye-clean with a few minute crystal and tiny needle type inclusions, one possibly visible with a trained eye. This gem has a simalar look to the Nigerian spessartite garnet. This pyrope garnet gemstone is very well faceted. It was cut from a natural color pyrope garnet crystal that was mined in Tanzania. This pyrope gem faces up completely eye clean. When examined very closely with bright illumination, it shows one tiny inclusion right on the girdle. 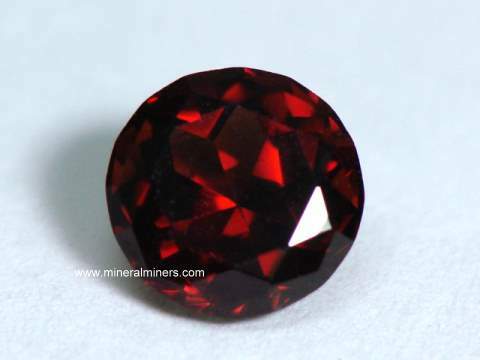 This gem has a refractive index of 1.759, and its color is a fine deep red. The color of this pyrope gemstone is completely natural with no heating or treatments of any kind. See also a side view of this rare quality pyrope garnet gemstone. This rhodolite garnet gemstone is very well faceted. It was cut from a natural color rhodolite garnet crystal that was mined in Tanzania. This eye clean rhodolite gem has a refractive index of 1.75, and its color is a slightly purplish red of dark tone. Under close inspection with bright illumination, this genuine rhodolite garnet gem shows some very faint natural inclusions. The color of this eye clean rhodolite gemstone is completely natural with no heating or treatments of any kind. This matching pair of 11mm round rhodolite garnet gemstones was precision faceted from natural rhodolite garnet crystals that were mined in Tanzania. These beautiful gems are calibrated at exactly 11.0mm round with checkerboard faceted tops checkerboard tops, and they were very nicely cut with good brilliance. These rhodolite gems face up eye clean and have faint natural inclusions that are only visible under very close inspection. They have a refractive index of 1.76, and their color is a purplish-red of medium dark tone (100% natural color - unheated and untreated). They will make a wonderful pair of genuine rhodolite garnet earrings! This rhodolite garnet gemstone was very well cut as a modified pear shape gem from a natural rhodolite garnet crystal that was mined in Sri Lanka. This fine quality gem is totally clean even under at 10 times magnification! It has a refractive index of 1.76, and its color is a purplish red of medium dark tone. The color of this rhodolite gemstone is completely natural with no heating or treatments of any kind. This beautiful round faceted gem of Rhodolite garnet was faceted from an alluvial garnet rough mined Sri Lanka. The color of the stone is a medium tone of slightly purplish red. This gemstone is exceptionally clean and very well faceted.This gem is all natural color,with no treatments. This beautiful round faceted gem of Rhodolite garnet was faceted from an alluvial garnet rough mined Sri Lanka. The color of the stone is a medium tone of slightly purplish red. This gemstone faces up eye-clean with a minor flaw possibly visible on the pavilion. This gem is all natural color, with no treatments. This beautiful round faceted gem of Rhodolite garnet was expertly faceted from an alluvial garnet rough mined and cut in Sri Lanka. The color of the stone is a medium deep tone of slightly purplish red. This gemstone faces up completely eye-clean. This gem is all natural color, with no treatments. This beautiful round faceted gem of Rhodolite garnet was faceted from an alluvial garnet rough mined in Sri Lanka and native cut (with a slight window). The color of the stone is a medium tone of slightly purplish red. This gemstone faces up completely eye-clean. This gem is all natural color, with no treatments. This faceted oval rhodolite garnet gemstone was very well faceted from a natural garnet crystal that was mined and cut in Sri Lanka. It faces up totally clean. It has a refractive index of 1.74, and its color is a slightly pinkish purple in natural day light and bright raspberry red under bulb light. See a photo of this genuine rhodolite garnet gem under incandescent (bulb) light. The color of this rhodolite gemstone is completely natural with no heating or treatments of any kind. This beautiful round faceted gem of Rhodolite garnet was faceted from an alluvial garnet rough mined in Sri Lanka. The color of the stone is a medium tone of slightly purplish red. This gemstone faces up eye-clean. This gem is all natural color, with no treatments. This oval rhodolite garnet gemstone was custom fancy faceted with a modified checkerboard top, (reminiscent of the "rose cut") from a natural garnet crystal that was mined and cut in Sri Lanka. It faces up totally clean. It has a refractive index of 1.75, and its color is a slightly purplish red of medium dark tone. See a photo of this genuine rhodolite garnet gem from the side. The color of this rhodolite gemstone is completely natural with no heating or treatments of any kind. This beautiful Rhodolite was mined in Tanzania, and is a beautiful gem of this variety of garnet. It is expertly faceted in the cushion cut fashion and is a medium dark slightly purplish red color. This gem is totally clean (flawless) to the eye. Under high magnification crossing needles are noted giving verification of its natural origin. The color is completely natural, no treatments of any kind. This beautiful round faceted gem of Rhodolite garnet was faceted from an alluvial garnet rough mined Sri Lanka. The color of the stone is a medium tone of slightly purplish red. This gemstone is exceptionally clean and very well faceted. This gem is all natural color, with no treatments. This rhodolite garnet gemstone was very well cut as a pear shape gem from a natural rhodolite garnet crystal that was mined in Sri Lanka. This fine quality gem faces up totally clean. It shows one long fine needle under 10 times magnification! It has a refractive index of 1.76, and its color is a purplish red of medium dark tone. The color of this rhodolite gemstone is completely natural with no heating or treatments of any kind. This rhodolite garnet gemstone was very well cut as a pear shape gem from a natural rhodolite garnet crystal that was mined in Sri Lanka. This fine quality gem faces up totally clean. It has a refractive index of 1.76, and its color is a purplish red of medium dark tone. The color of this rhodolite gemstone is completely natural with no heating or treatments of any kind. This faceted oval rhodolite garnet gemstone was very well faceted from a natural garnet crystal that was mined and cut in Sri Lanka. It faces up totally clean. It has a refractive index of 1.75, and its color is a slightly pinkish purple in natural day light and bright raspberry red under bulb light. The color of this rhodolite gemstone is completely natural with no heating or treatments of any kind. This faceted oval rhodolite garnet gemstone was very well faceted from a natural garnet crystal that was mined and cut in Sri Lanka. It faces up totally clean. It has a refractive index of 1.745, and its color is a slightly pinkish purple in natural day light and bright raspberry red under bulb light. See a side view photo of this genuine rhodolite garnet gem. The color of this rhodolite gemstone is completely natural with no heating or treatments of any kind. This octagon cut rhodolite garnet gemstone was native faceted from a natural garnet crystal that was mined in Tanzania. It was native cut with good brilliance. This rhodolite gem faces up eye clean and has faint natural inclusions that are only visible under magnification. It has a refractive index of 1.75, and the color is a purplish-red of medium dark tone (100% natural color - unheated and untreated). This rhodolite garnet gemstone was well faceted from a natural garnet crystal that was mined in Sri Lanka. It is nearly clean with small natural inclusions difficult to see even under very close inspection with a trained eye. It has a refractive index of 1.76, and its color is a slightly purplish red of medium dark to dark tone. The color of this rhodolite gemstone is completely natural with no heating or treatments of any kind. This rhodolite garnet gemstone was very well faceted from a natural garnet crystal that was mined in Sri Lanka. It faces up totally clean. It has a refractive index of 1.75, and its color is a slightly purplish red of medium dark tone. The color of this rhodolite gemstone is completely natural with no heating or treatments of any kind. This beautiful trianglular faceted gem of Rhodolite garnet was faceted from an alluvial garnet rough mined Sri Lanka. The color of the stone is a medium dark tone of purplish red. This gemstone is eye clean and well faceted. This gem is all natural color,with no treatments. This is the end of our Garnet Gemstones virtual gallery page. See also our Garnet Information page. To see more garnet photos, just select another item category from the table below. To see photos of another mineral variety, select any item category link in our Mineral Inventory & Factsheet Index. Would you like us to inform you when we add on this page more natural garnet gems? We do have additional inventory of natural garnet gemstones in stock, so be sure to let us know if you have any natural garnet gemstone special requests. Please contact our webmaster or our 'site' geologist with any questions or comments.